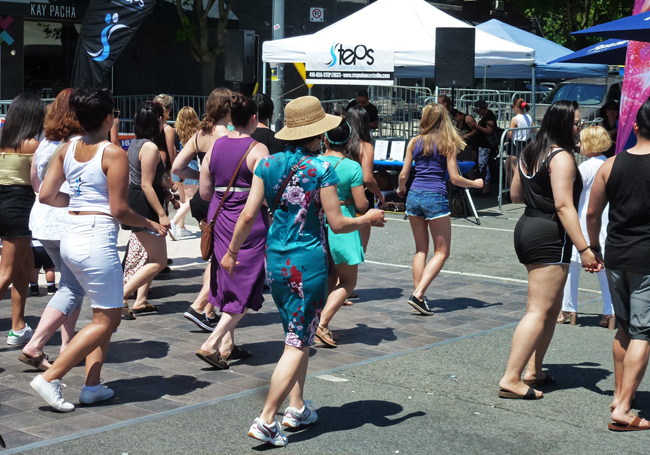 One of the highlights of the Salsa On St Clair event is the dancing which is led by several dance schools scattered along the street. Part of the time they do demonstrations with really talented dancers which make you want to go for Salsa lessons. With that in mind they also conduct mass introduction classes such as this one. It is interesting that it seems to be all women who are brave enough to get out there and try it. The guys all seem to be a bit shy! Hello, looks like fun, I wish I was a dancer. Enjoy your day! It looks like fun! What you don't understand, is that when I dance, it looks exactly the same as when I'm standing or sitting still. Take right now, for example, I'm boogey-ing! I like the sense of action to the shot. It does look like fun....even if you don't know what you are doing. In fact, it's probably more fun. Looks like fun with the dancers in the street. I tell you this dancing period is so important in life! Truly! I'd try it! Looks fun. This does look like fun, but you would NEVER see me out there. I have three left feet.